Avg. Group Discount of 12.5%! Our downtown location is in the heart of the Gaslamp Quarter featuring 150 different restaurants, museums, shopping and nightlife. Two Blocks from the San Diego Convention Center and adjacent to the San Diego Padres PETCO Park. Only three miles from the San Diego International Airport, 2 miles from the World Famous San Diego Zoo and he museums of Balboa Park, and a short Trolley ride to Historic Old Town. All 306 luxuriously appointed guest rooms, with spectacular views, include: pillow-top mattress, plush down comforters, 300-thread count butter soft linens, high-speed & wireless internet access, smart desk with data port & two phone lines, 27-inch flat screen television, CD player, Gilchrist & Soames of London bath amenities, ionic hair dryer, iron & board, granite bathroom countertops, coffee maker, complimentary daily newspaper and express video check out.The centerpiece of the hotel is Altitude Sky Lounge, our rooftop sky bar and garden lounge, soaring 22 stories above downtown with sweeping views of the ocean, skyline and into Petco Park. Also at your service is a business center, complimentary fitness center, two concierge floors with exclusive lounge, dry cleaning services, in-room dining and valet parking. Soleil @ k, our stylish restaurant, is located in the lobby of the Hotel featuring a fresh California Cuisine and a display kitchen with wood-fired pizza ovens and rotisserie. Soleil @ k provides outdoor patio seating. Latitude Lounge, our lobby level lounge is a great locals hangout that features local brews and an extensive wine list.Our downtown location is in the heart of the Gaslamp Quarter within two blocks of the San Diego Convention Center and trolley station, and adjacent to Petco Park, home of the San Diego Padres Baseball Team. Only three miles from the San Diego International Airport, two miles from the World Famous San Diego Zoo and the museums of Balboa Park, and a short Trolley ride to Historic Old Town. This impressive property offers business and leisure travelers easy access to everything… shopping, dining, golf, beaches, and major area attractions. Local Shuttle Info: Cloud 9 Super Shuttle is a 12 minute ride (3.2 miles) and costs $8 per passenger from airport to hotel. Breakfast available at Soleil @K featuring American cuisine. 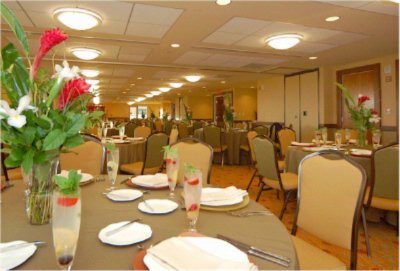 Offering the Full Marriott Breakfast Buffet and numerous breakfast specialties. Serving breakfast from 6:30am to 11am Monday and 7am to 11am Saturday and Sunday. Complimentary Wi-FI in the hotel lobby, computers with internet access in the business Center complimentary. 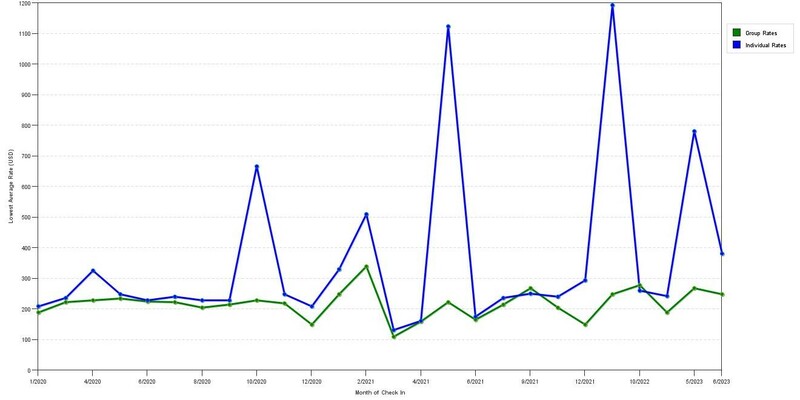 The graph above is averages of room rates for both group/meeting quotes and the lowest online individual rates our rate checker could find at the time the group/meeting offer was entered. The most competitive group deal shown is 88.3% in March 2020 and the highest average individual rate is $1879 in the month of March 2020. This chart will show past seasonality and also project future months. If you are flexible with dates, you may want to consider staying at San Diego Marriott Gaslamp Quarter in a month when rates are lower. 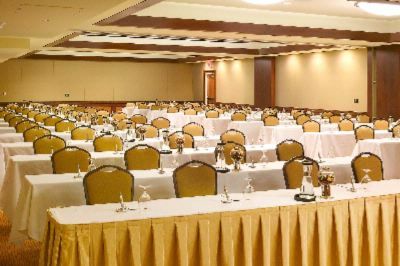 Below are the meeting, banquet, conference and event spaces at San Diego Marriott Gaslamp Quarter. Feel free to use the San Diego Marriott Gaslamp Quarter meeting space capacities chart below to help in your event planning. Hotel Planner specializes in San Diego event planning for sleeping rooms and meeting space for corporate events, weddings, parties, conventions, negotiated rates and trade shows. The San Diego Marriott Gaslamp Quarter features 8,000 square feet of functional event space, including outdoor terraces providing breathtaking panoramic views as the backdrop. You'll never do business the same way again. 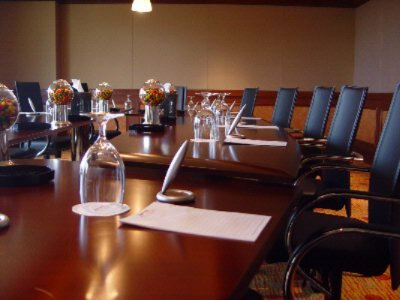 Meetings and events at the San Diego Marriott Gaslamp Quarter are the perfect convergence of business and pleasure. 32 x 77 x 10 Ft. The San Diego Marriott Gasalmp Quarter features 8,000 square feet of functional event space, including outdoor terraces providing breathtaking panoramic city views as the backdrop. You'll never do business the same way again. 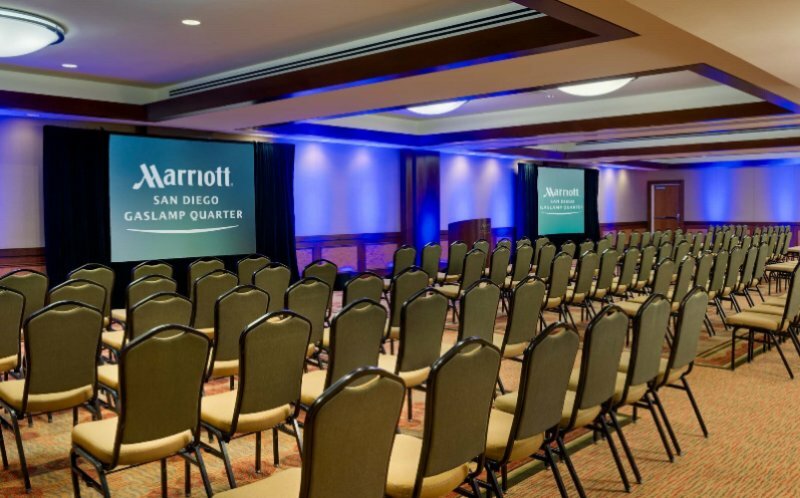 Meetings and events at the San Diego Marriott Gasalmp are the perfect convergence of business and pleasure. 32 x 76 x 10 Ft.
17 x 27 x 8 Ft.
24 x 92 x 8 Ft.
24 x 93 x 8 Ft.
22 x 26 x 8 Ft.
27 x 25 x 8 Ft.
24 x 33 x 8 Ft.
35 x 27 x 8 Ft.
32 x 39 x 10 Ft.
24 x 34 x 8 Ft.
32 x 36 x 10 Ft.